This analysis might be familiar to readers of Alasdair McIntyre and especially After Virtue. And indeed, Bateman is indebted to McIntyre, not only in deploying virtue ethics, but in critiquing what he terms the moral disaster of individualism, which ‘sacrifices any more substantial freedom in favour of merely pre-prescribed market decision,’and the moral disaster of consequentialism, with morality ‘reduced to mere mathematical calculations’ that fail to discern what is truly at stake in moral judgements. That is, Bateman has McIntyreian reasons for deciding not to examine the morality of cyborgs from a deontological or utilitarian stance. For him, as with McIntyre, virtues are defined as ‘qualities that acquire their meaning from practices that people pursue together, since only in a shared context do qualitative judgements possess a common ground.’ This shapes his thesis, since he is less concerned with the types of calculations and intentions that preoccupy many accounts of the morality of new technologies, and more with the way technologies shape and change the humans who use them, ‘It is not that our tools act without us, but, through modifying our capabilities for action, the things we use reconfigure the moral space we move within.’ The Virtuous Cyborg is a look into that moral space. Bateman always draws from a range of philosophers (in this book, these go from Ivan Illich to Kant), which reflects a conscious methodological pluralism, but here he also draws from a more specific set of religious-philosophical traditions that coalesce around virtue. He presents a list of cybervirtues not as ‘a complete set, but rather[…] signposts that mark out the territory we are currently lost within.’ Finding inspiration in Taoism he starts with restraint, respect (or humility) and kindness (which find their opposites in compulsion, disdain and cruelty respectively). Courage, justice and honesty are derived from McIntyre’s philosophy, to which Bateman also adds the virtues of tact, tenacity, fidelity (especially as a free commitment to a tradition) and deep-sightedness (as opposed to shallow-sightedness). For this last virtue, he turns to Michel Callon and Bruno Latour’s actor-network theory (ANT), to outline the idea of the cyberg, ‘the network that produces and maintains the more complicated cyborgs’. Discerning the obscured cybergs from the cyborgs that make them up is deep-sighted in that it permits greater nuance and comprehension of cyborgs. That is, deep-sightedness is a meta-virtue, permitting or enhancing the others at an analytical level. Often, the larger the cybergs, with the largest termed gigacybergs and containing billions of constituents, the more morally relevant they are too; gigacybergs include cars, nation states (such as India and China), Microsoft, television, Facebook, the Internet and, largest of all, money. At the end of reading one feels a mixture of pessimism and hope, which is perhaps what a worthwhile book about morality ought to convey. 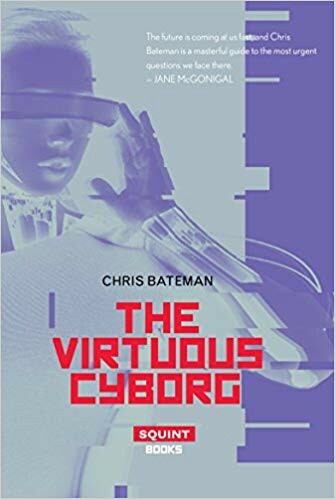 I was also left wanting more, as The Virtuous Cyborg is not exhaustive, and I am glad that Chris Bateman is currently writing a blog project entitled A Hundred Cyborgs. There are many attempts to provide this type of analysis right now — even in popular shows such as Charlie Brooker’s Black Mirror — but what is provided by this book is not simply a fearful look at the dystopian possibilities of our current technological and moral impasses, but a theoretically informed attempt to traverse this nightmarish portrayal in the hopes for something, I hope, utopian.